Paring knife is very essential for delicate kitchen tasks which require high degree of precision. Paring knives are smaller and more delicate than conventional chef’s knives. Paring knife can be used for deveining shrimp, peeling onion and garlic, cutting small fruits, trimming vegetables, slicing cheese, etc. Paring knife is also suitable for other jobs in the kitchen such as checking the the tenderness of cake or some other dish, decorating pastry and even opening vacuum sealed packages. Basically, a paring knife can be used for all the tasks which would be difficult to do with a chef’s knife. There are three types of paring knives available in the market. Bird’s beak paring knife has a concave blade which resembles a sickle. The tip is very sharp and protrudes over the side of the blade. This type of knife is suitable for trimming, peeling and other delicate knife works. Classic paring knives is also known as spear tip knife. The blade is short and is outwardly curved. The blade extends right from the handle to the pointed tip. This type of paring knife is used to peel thin skinned fruits and vegetables, slicing fruits and vegetables and removing the cores of fruits and vegetables. These are some of the best paring knives which have received excellent reviews on Amazon and other online stores. Wusthof Classic 3 ½ inch paring knife is a high end paring knife. The high cutting ability, high degree of maneuverability and good control makes this knife a favourite among people. The main features of the knife are as follows. The blade is constructed of high carbon stainless steel and is one of the sharpest blades among other knives. Each side of the blade has been sharpened by 14 degrees. This has doubled the sharpness retention of the blades. The high-impact ergonomic handle enables good balance and control. It is a full tang knife. This is a straight edge paring knife which can be used for mincing, peeling, dicing, slicing and garnishing. It is an ultra lightweight paring knife which makes it easy to use. Other features are as follows. The tapered knife edge has been designed to hold sharpness for longer periods of time. The cutting efficiency of the edge is also very high. The knife comes in both straight and serrated edge varieties. The short blade has been designed for improved accuracy and good control. The handle has been ergonomically designed and has non-slip grip. The handle is made of polypropylene. It is durable and safe to use in a dishwasher. The knife is suitable for peeling fruits and vegetables and also for dicing onions and slicing mangoes. This is a high quality paring knife by Mercer. The features which make it one among the bestsellers are as follows. The blade is made of high carbon no-stain German cutlery steel. The blade is highly resistant against rust, corrosion and discolouration. The blade is very sharp and the taper ground edge ensures that it retains the sharpness and increases the efficiency of cutting and chopping. The Santoprene handle has been ergonomically designed for comfortable handling. The non-slip grip of the handle allows the knife to be used easily even with wet hands. Tang has been designed for good balance. This is a 4-inch paring knife which easily hulls strawberries, slices through hard cheese and peels apples. The knife comes with a plastic sheath to protect the blade. Other features of the knife are as follows. 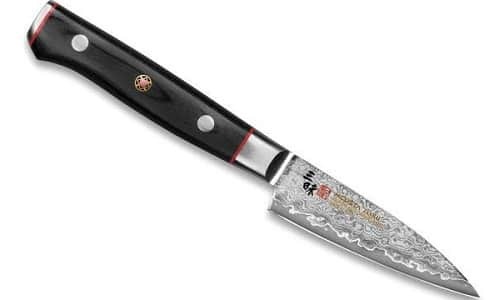 The blade is constructed of Japanese carbon steel which retains sharpness effectively. Easy to grip plastic handle. The blade has a nonstick colour coating. 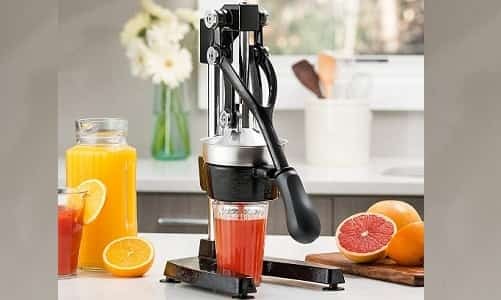 This prevents the slices from sticking to the blade and allows them to slide off. Available in many colours such as black, lemon, green, fuchsia, orange, pink and many more. This is a 4-inch blade paring knife with a long handle. The knife is forged from a single steel bar which means there is a seamless transition from blade to handle. This makes it highly durable. Some other features of the knife are as follows. The blade is constructed of German stainless steel which resists rusting and discoloration. The handle has an ergonomic design and is triple riveted to provide comfort and good balance. The knife has a full tang. Safe to be cleaned using dishwasher. This is a paring knife made in Japan by the company MAC which has become a well known name in the Japanese steel market. Chief characteristics of this knife have been mentioned here. The 2mm blade is made of high carbon steel. The blade is very sharp and retains the sharpness for a long time. The blade is also resistant against rust. The handle is made of pakkawood. This makes the knife light in weight. The knife is suitable for removing stems from strawberries or tomatoes besides peeling or coring small fruits. The knife is not dishwasher safe and should be hand washed. This is paring knife from the Gladiator series by Dalstrong with a blade length of 3.75 inches. The design and material used in making the knife makes it suitable for professional kitchens. The main features are as follows. The blade is made of imported high carbon German steel and has a 14-16 degrees hand polished edge each side. The blade has been perfectly tempered and is stain resistant. The rockwell hardness of the blade is more than 56. Razor sharp edge with a full tang. The tapered design of the blade provides flexibility during slicing and also enhances hardness. The black pakkawood handle is triple riveted. It provides a comfortable grip and makes maneuvering very easy. The bolster makes it a well balanced knife. Comes with a sheath which is water and stain resistant. This is a 4-inch paring knife manufactured in Germany. The high-grade features of the knife have been listed here. The knife has been forged from a single piece of solid steel. The blade is constructed of special formula high carbon stainless steel. The blade has been ice hardened to be very sharp and retain sharpness for a long period of time. The rockwell hardness of the blade is 57. The edge has been cut using laser at an ideal angle to ensure sharpness and durability. The angle of the edge is 15 degrees each side. 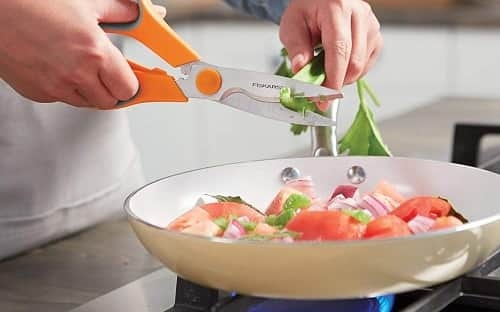 The ergonomically designed handle is constructed of polypropylene and is permanently bonded to provide greater accuracy for cutting or chopping. This paring knife by Mcusta Zamai can be used for peeling, slicing, dicing and scraping vegetables, fruits and other food items with ease. The knife is a blend of good aesthetics and excellent cutting performance. Some other features are as follows. The blade is 33 layer Damascus blade with VG10 super steel core. Rockwell hardness is 60-61. The blade angle is 9-12 degrees. The extremely sharp edge cuts through vegetables, fruits and other food items smoothly. The black pakkawood handle is triple riveted to ensure stability and also has red spacers. 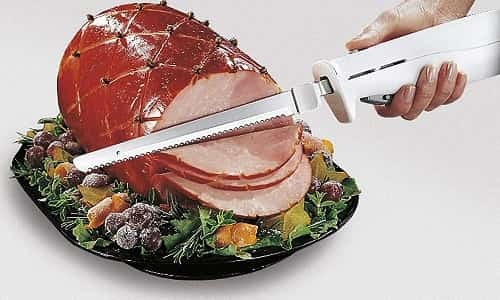 Ergonomic design of the handle enables comfortable slicing and dicing. The knife has a stainless steel end cap which adds balance. This is a handcrafted knife made in Seki city, Japan. This is a very sharp and durable professional quality paring knife. The knife effortlessly cuts through vegetables, fruits and other items. The main features of the knife are as follows. The blade is made of 101 layers of high-carbon stainless steel. It is also ice hardened and heated to impart greater stability. The blade is also resistant against corrosion and stains. The handle is made of Canvas-Micarta which provides a strong and comfortable grip. The handle also has three stainless steel rivets to provide extra durability and comfort. The knife is dishwasher safe and can also be hand washed. The knife is capable of tolerating heavy usage owing to its high durability. 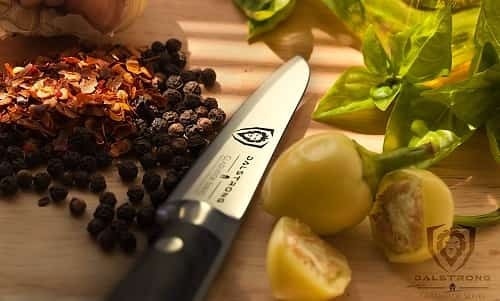 Are you looking for a knife that could ease the peeling, zesting, pitting, and paring tasks then you would definitely need a paring knife. Here is a buying guide that could help you select the best paring knife from the market today. 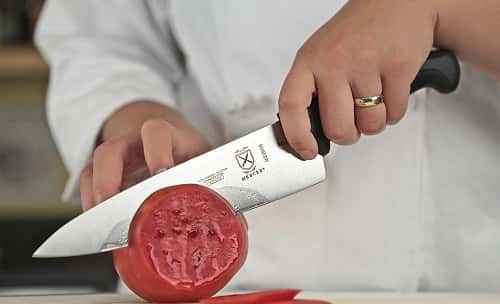 Buying guide – The whole purpose of using a paring knife is that it is small and it offers greater control and stability in using it. The pointed tip allows the user to remove the unwanted part without wasting anything good. Blade material – A paring knife could be made of any two of the below two materials. It is not that a paring knife on the market would be made of these two materials only, but, if your preference is to get the best paring knife then the best durable materials are listed below. Carbon steel knife – The paring knives made of carbon steel knives are durable, sturdy, and efficient. It is one of the most commonly used and preferred paring knife today. However, the user will have to give extra care to the knife if he/she tends to use a healthy, clean, and good looking knife. Stainless steel knife – It is a basic fact that stainless steel is lightweight and resistant to rust and stains. A stainless steel paring knife is lightweight and flexible when compared to carbon steel paring knives. As mentioned above, stainless steel and carbon steel paring knives are not the only two materials used to make a knife, but there are other materials also available. But there are other materials also, but, as far as, our expertise these are the only two top quality materials you could consider. Handle material – A paring knife with an annoying handle would prove good for anything. However, the material with which the handles are made is important. Polypropylene – This type of handle is durable, riveted together in an attractive way. But they are harder and would not always be comfortable to use. Steel – Steel handles are durable and could come with a texture that offers enhanced grip. Plastic – We recommend that you do not go for this type of handles as they are less durable and could break easily. Another reason to avoid this type of handle is because plastic handles are glued to the blades and they could come off easily. Grip – Not all paring knife comes with a handle that offers grip. You very well know that paring knives are small when compared to any other knives, this, in turn, demands the paring knife to have enhanced grip. This is why we recommend that you consider purchasing a knife with a handle made of steel or polypropylene. Weight – You will not appreciate having a heavy weight paring knife, as it could prove unbalanced and make the job challenging. This is why we recommend that you purchase a knife after checking its weight in the specifications. Brand – Most of the people assume brand has nothing to do with a paring knife, but it is wrong. Only top brand delivers best products and this is why it is very important that you consider purchasing a product from a top brand only. If you are a person who believes that cleaning and caring a paring knife is not required, then you are wrong. Let it be made of any material a paring knife has to be cleaned frequently after use. Once you are done using the knife, you will have to dip the knife in water. Then, you will have to take a sponge, dip it on water and wipe both the sides of the knife to remove the deposit. After you have completed cleaning wipe the knife dry and store it in a place without any moisture or humidity. If you find the deposit or any sort of dirt sticking to the surface of the paring knife, then you should resort to soaking the knife in water for about 5 minutes and then use a soft scrubber to scrub off the dirt or deposit. Now wipe to dry the knife with a dry cloth and store the knife at a dry place. If you were looking for the best paring knife on the market, the details mentioned above could help you select and purchase the best product. Remember that it is not just the purchasing of paring knife that is important, the frequent cleaning is also important. There are multiple factors on which paring knives are assessed such as sharpness of the tip, weight, comfort in handling and sturdiness. The material of the blade and the handle and the overall design also determines the quality of a paring knife. The above mentioned paring knives have received positive reviews with respect to these factors.